Shed it…… – Dirty wet dog , boats and sailing. Several months ago when the Colin Firth film ‘The Mercy’ was released i spent some time re-reading everything i could find about the original Golden Globe race. My main attention then was on the life, mental breakdown and death of Donald Crowhurst,but as a side story i wrote briefly about some of the ‘nine’ that set out on that race. Robin knox-Jonhnston i have had the pleasure to speak with, the others i know little about except for what i have read and with the exception of Chay Blyth. I only met Chay Blyth just before i accidentally took part in his first BT Global Challenge race. That itself is a bit of a story in that i had just returned from one circumnavigation and hadn’t even unpacked my kitbag before heading off again. At some time i will return to my partially written post about the most interesting character of them all : the late Bill King. For now i want to use my brief Chay Blyth connection for this post and specifically one of his ‘salty’ expressions…..’shed it’ , or as he often said : “shed that” when something wasn’t working. I will fully admit that i didn’t take to Chay Blyth at all when i met him before the BT race but then being a ‘nice bloke’ was never in his job description as parachute regiment sergeant and hard-nosed business entrepeneur. The other side is of course that he really did enter the Golden Globe race in a very unsuitable boat and got it as far as South Africa despite knowing nothing about sailing when he set out. Chay’s expression ‘shed-it’ is just one of many ways of saying something even saltier when something just won’t work out. What he meant is, i think, something along the lines of ‘that idea isn’t working out so dump it in the shed’. All sailors that i know have their own version and usually a lot more direct and ‘saltier’. The purpose and thinking behind my own version of the expression is to realise as quickly as possible when something isn’t working, doesn’t look as though it can be made to work with my available effort, finances or time and put that thing aside firmly and quickly. I have posted briefly before about our use of time as a critical life resource and this too is a part of that. Jackie relaxing aboard Inanda : “scruffy but cozy” in her words. 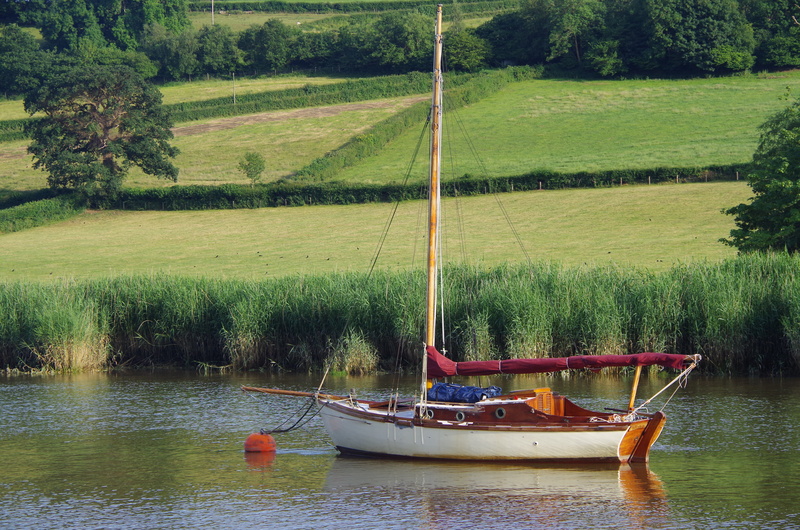 It does feel like a bit of a low point in my sailing though as i had invested a fair bit of time and effort in the project believing that a small classic boat might work for me. The experience i have gained with Inanda suggests very strongly that this is the wrong route for several reasons. In real time one of the reasons for ‘shedding’ Inanda is that i have a hot date with a surgeon in 2 days time and the likely outcome of that makes the project a non starter. The main reason for that is my more careful estimate of the time i would need to spend working on the new knee….that’s just not a good idea or the best use of my time. Taken a bit further i got to the point where i could imagine having put a lot of time and effort into the project, possibly as much as 2 years and still not having a good boat at the other end. When i have time to do a longer post i will re-visit the Inanda experience with the good and the bad. As of right now (as i write the post) Inanda is listed on Ebay for a quick sale and WABI”’ is fully back in commission, antifouled and in the water. I am also totally re-thinking my sailing plans and trying to work out how best to use my time and energy. The most likely outcome at this time is that i will try to find a potentially viable long distance cruising boat project and make some compromises with my requirements. Last night on board Inanda, anchored in the Yealm. Well, i have taken all my personal gear off Inanda and as i write we are actually heading back to Weymouth for an actual holiday by the seaside. I intend to go splash in the sea intentionally and have a big fat ice-cream on the beach ! Today, in real time, is my last planned day at work before my own refit ! after that i am supposed to be out of action for a few weeks. There might now be an actual pause in the blog because everything up until this post was mostly written several weeks in advance. I do have some posts written, edited and scheduled so they will come out over the next few weeks and i will update those with real-time news as i go along. It does also mean that a lot of my recent project posts are completely irrelevant now except that the exercise of of planning and problem solving is, i believe, always worth the effort. When i get back to writing i will write a longer post about the Inanda experience and explain why i made the decision that i have done. After that i intend to be writing and talking/filming about the new project because this down-time will also represent a change in the blog….essentially that i want to have another attempt at filming and narrating rather than just photographing and writing. I hope you all have a good sailing summer, i guess that’s about it for my sailing this year : not many actual trips but quite a few sea miles from Ipswich all the way around the coast with Inanda and some tough sailing with the Liberty earlier in the year. I hope to be back on the water in the autumn and down to just one boat by then although which boat i really wouldn’t like to say. Previous Ergo 1 : cockpit. Next Anchors are heavy ! Good luck with the personal refit Steve and enjoy that ice-cream. Looking forward to your thoughts on long distance cruising boats and cinematic story-telling endeavours. Cheers.